Food Addicts: we have eaten more than our share! We are to blame! Our gluttony and compulsive eating behavior have finally caught up with the world. In eight years this planet will be suffering from a chocolate shortage that will threaten humanity with suffering the likes of which we have never seen. 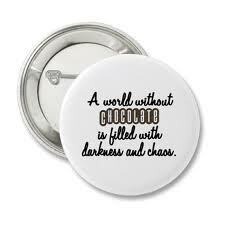 And I do mean suffering, because if women with PMS cannot get their chocolate fix the world will be a very dangerous place. Think about it: Cleopatra tasted chocolate. She knew how good it was. When Rome took away her chocolate and all she had left was Marc Anthony, she killed herself and changed the face of the world. The Incas? 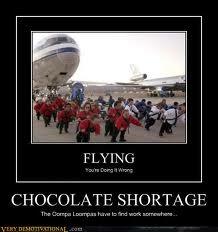 They disappeared when their chocolate crop failed. You don't believe me? You can check my facts on Stickiwikipedia: the website for cheeky facts on sugary sweet subjects. 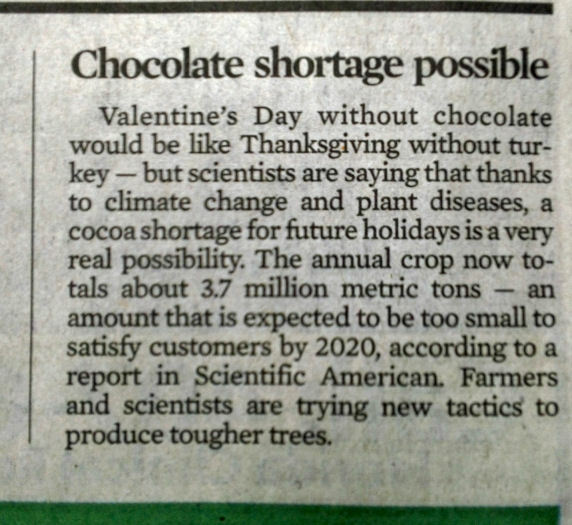 But seriously, what does this chocolate shortage mean for the rest of the world? I don't know. But I know that I am someone who contributed to the problem and now I must be an adult part of the solution and give back what I have so generously given to myself. But I ate all that chocolate a long time ago. I could give up my daughter Rory's Easter basket. After all, she is twenty three. Oh wait, we stopped giving her an Easter basket when she was in college. She doesn't get one anyway. No wonder I didn't steal, pilfer, bite into any of her chocolate bunnies over the past few years. The only chocolate I eat today is pure cocoa powder, which contains no milk fat and no sugar. It may seem like a small thing to give up, but it is all I have. I will give it up my cocoa for Lent this year if it means some little ankle biter will get a chocolate bunny eight years from now because of my sacrifice. Before chocolate reaches the critical shortage level and rationing or black market kisses become the rule, I hope congress will pass a mandate to regulate chocolate as a medicinal product. Otherwise normally law abiding women may bow to pressure and go to Switzerland or Belgium for illegal chocolate bars. If ever we needed to make sure we have a woman as president it is four years from now. This way she will have four years to pass the Presidential Chocolate Protection Act for Women and Children. Menstruating women will be guaranteed access to a block of chocolate each month, or at least, a chocolate patch. Each child will get a chocolate bunny with hollow ears. Possession of Cadbury's crackberry creme eggs will be federal crime due to the highly addictive nature of the product. As we all want to be keeping the pounds off eight years from now, what will you do to save the world from a chocolate shortage in 2020? I hope our present government doesn't get wind of the association of chocolate with health care. They are going to find a way to link their mandates, regulations, and taxes to the health care bill as it is! 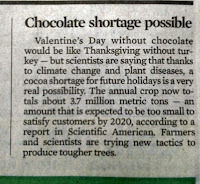 I'm right there with the women who will go fight for our chocolate! A world without chocolate would just be wrong. It's SOO true though! I'm not the only one?? Thank you, God! Fabulous post. As always, I look to you for inspiration, motivation, and straight forwardness. You never dissapoint. Thank you, thank you. Haha! I can see the waves of petitions starting! I believe this story has been kepton the QT - it would be like the world wide wave of Female Spring. That up there - 7:12 pm. It was me. Problems with your captcha.